Introduce the idea of a research question. Use knowledge of mechanics to develop a hypothesis. Use practical skills to design an experiment to test a hypothesis. Use "detective" skills to evaluate results. Practice writing a formal report. In this activity you will perform an experiment related to a small bow and arrow made from a piece of plastic from an ice cream carton and a drinking straw. The bow is used for firing arrows so most experiments will probably be about the projectile motion how ever you could do a static experiment measuring forces. 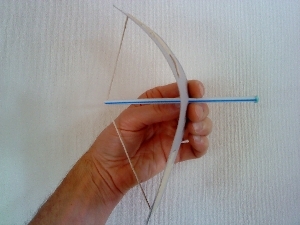 The first stage is to make the bow and arrow and play with it. A research question is of the form "what is the relationship between one variable and another" the first thing to do is to think of the possible variables? This is the quantity that you are going to change e.g the mass of the arrow. Make a list of the the possible independent variables that you could change (I got 10). This is the quantity that changes because of the change in independent variable e.g. the distance travelled by the arrow. Make a list of quantities that might change if you change the mass of the arrow. These are quantities that might also affect the dependent variable so must be kept constant. e.g. If you are investigating the relationship between range and mass of arrow you must make sure the angle of projection is kept constant. What other variables must be controlled in the example above? What is the relationship between the range of an arrow launched at an angle of 45° and the mass of the arrow? Make a list of all the research questions you can think of. Internet research is a good way to get some inspiration, background information and help with the theory but you should not use the internet to cut out the whole of the creative process of devising a research question. Searching for "the physics of archery" is OK but "physics projects involving bow and arrow" is not. It is very important to choose a good research question, if you don't have a good question you won't be able to write a good report. Is there a relationship? If there is no relationship between the variables then it's not going to be a good investigation. Try a quick experiment to see if changing the independent has any effect of the dependent. Do you have any idea what the relationship might be? It is easier to write a good report if you understand the underlying physics. If you can apply the theory to derive an equation then you can test the relationship graphically, if you don't know the equation you might be able to find the relationship graphically but it's not so easy. Can you measure the variables? No point in choosing acceleration as you dependent variable if you can't measure it. Choose your research question and discuss it with your teacher. If it doesn't turn out to be a good one then you can always change it later. Write your research question and list your variables, independent, dependent and all the controls. "In science, a hypothesis is an idea or explanation that you then test through study and experimentation. Outside science, a theory or guess can also be called a hypothesis." (vocabulary.com) This is important, it's not a guess, you should use the physics you have learnt during the course to try to derive some sort of relationship. It might be wrong but it should be based on some physical principles. Conservation of energy is often a good starting point. If the string is pulled back the same amount each time what can you say about the elastic PE? If the elastic PE is E write an equation for the KE of the arrow. Rearrange the previous equation to make v the subject. The range of a projectile launched at 45° is given by the equation R = v2/g use this to write an equation relating v and m.
This derivation made many assumption e.g. the elastic PE is the same each time. It is important to be aware of these assumptions as they will be mentioned in the evaluation. What other assumptions have been made? Write a hypothesis for you research question and if possible derive an equation (ask your teacher for help if you get stuck). List any assumptions you make. If you thought about how you are going to measure your quantities when you decided on the research question this part should be easy but its not just about taking some measurements, the measurements must be precise enough to reveal the relationship. You don't want to conclude that your experiment didn't prove anything because the uncertainties are so big. One way to test your method is to find out if your measurements are repeatable. e.g. Fire the same arrow several times in the same way and measure the range. Decide on how you are going to measure your variables. Think how you will ensure all other variables are kept constant. Test the repeatability of your method. It's difficult to say what is an acceptable level of random error but around 10 % is OK. You will often find that the random error will get less as you practice the method, this is particularly true for an experiment involving shooting arrows. If your values are varying by much more that 10 % you should change the method (it's most likely that you aren't keeping the controlled variables constant) or scrap the whole research question and think of a new one. To reduce the random error you should repeat you measurements for each value of the independent variable about 5 times. Later on you will find the average of these values. If you have managed to linearise your equation then you will be plotting a straight line graph which will need a minimum of 5 points, however if you are going to plot a curve you will need more. The range is often limited by the equipment. Make an appropriate table is Excel ready for your data. Perform the experiment entering your data directly into the Excel table. It's not always possible to linearise the data for example if u does not equal 0 you can't linearise s = ut + 1/2 at2 but you can plot a parabola. If possible manipulate your data so that you can plot a straight line, you have to know the equation relating the data to be able to do this. Calculate the uncertainties in you manipulated data using the usual (max - min)/2 method. The graph gives a visual representation of the data making it much easier to interpret, especially if its supposed to be linear. Using LoggerPro plot a graph of your data including error bars, best fit line and manually placed steepest and least steep lines. The gradient of your best fit line will have some physical significance, for example in several of the labs you performed earlier in the course the gradient was used to find the acceleration due to gravity. If you know what the gradient is supposed to be then you can compare it with the known value. Maybe you need to do separate experiment to check your value e.g. the gradient might be related to the "spring constant" of the bow, you can measure this by stretching the bow with a force meter. The curve will have various coefficients, each of these should have some physical significance. You shouldn't simply plot the curve that fits best, the curve should be based on an equation that has been derived from physical principles. Your graph is a representation of your results so should be used to help you draw a conclusion. Do your results support your hypothesis? Do any calculated values (gradient, intercept or coefficients) agree with expected? Here you say either how you can be sure that your results can be trusted to support your hypothesis, or reasons why your results did not support your hypothesis. Again use evidence from you graph to comment on. The spread of data from the best fit line. What was the weak point in you method? Small error bars and data close to the line show that you data was collected carefully. Imagine you are selling your results and need to convince your customer of their worth. Here you must be like a detective, use evidence from the graph to analyse what happened. The biggest challenge here is to decide if it is the experiment or the theory that was wrong. Is the data scattered or does there appear to be some relationship? re visit the assumptions you made at the start. Did you really manage to control the variables? Were your measurements just too inaccurate? Does your graph reveal a different relationship? Its not enough to simply say "use better equipment" you need to make specific suggestions as to how the experiment might be done better. Any improvements should address the weaknesses mentioned already. Would your method be improved with better measuring devices? Would more measurements have made any difference? Could you have controlled the variables better. It's no good suggesting a completely different experiment here. Simulations show what should happen according to the theory so are useful to see what your theory actually predicts should happen so you can compare with reality. In Algodoo you can remove air resistance for example so if you think air resistance is causing problems try simulating the experiment with and without air. Introduce the bow and arrow, what is it made of etc. A photo is a good idea. State it clearly, list your variables. Use your knowledge of physics to derive a relationship. It doesn't matter if it turns out to be wrong but the physics should be applied correctly. Deviations between theory and practice are often due to incorrect assumptions. Make a prediction (hypothesis) based on the theory. What you measured and how you measured it. How were controlled variables controlled? This will be in the form of a table. Don't forget uncertainties (these must be explained). Follow the same procedure as in other practicals you have done. Manipulate your data in a spreadsheet and propagate the uncertainties. Linear if possible but if a curve try to fit the best curve according to your theory. What did you find out. Why do your results not exactly match the theory (they never will). Is it because of the theory doesn't apply or was it because of experimental errors? If you compared with a simulation write about that here.